Published in the South Kent Gazette, 25January, 1980. Immediately opposite Nos, 80 and 32, St James's Street was St Margaret’s Place, a cul-de-sac that was enclosed by a brick wall, and added to the nearby brewery premises in 1918. Adjoining this courtyard was the residence of Mr William Youden, whose elder brother, John, founded the School at St Margaret’s-at-Cliffe, which was afterwards, for many years, carried on by Mr James Temple and Mr James Temple, jun. Mr William Youden’s eldest daughter married Mr Thomas Lewis, surgeon, of Snargate Street, and their son, the late Mr Thomas Lewis, was Clerk of the Peace for Dover and Vestry Clerk of St James's Parish. Mr William Youden, and his son, Mr John Eastes Youden, were each in their turn churchwardens of St James's. Mr John Eastes Youden built St Margaret's Place on the yard that adjoined his father’s house, the name being derived from his uncle’s connection with St Margaret's. The other houses on the north side below the East Kent Road Car Company’s garages (once the Gas Office yard) were mostly modern; the largest, a substantial, square, brick residence, dated from the time when the neighbouring brewery was owned by Mr Walker, and that was his residence. It was not easy to judge the age of the houses on the south side, above St. James's Passage, the fronts having been transformed for trade purposes, but there was one, No. 70. next above Wall Passage, which possessed an unmistakeable Elizabethan front, presenting a gable to the street, in which there was ornamental red brick work. This front, although covered by whitewash, was the most complete in its preservation of the old residential nature of St. James's Street. Notwithstanding its ornate brickwork in front, other parts suggested that at the early period when this house was built the tottering town wall, which stood on the west side of it. had been used as a quarry. From this old house up to Fox Passage there was nothing having pretensions to antiquity. 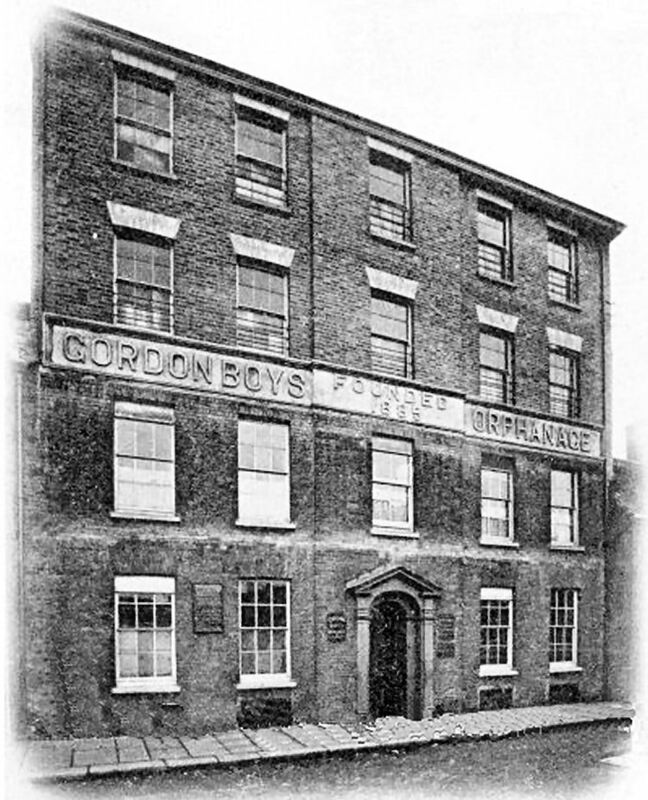 Above photo showing the Gordon Boys Orphanage. The above picture, shows boys in their distinctive tartan uniforms, and members of the staff of the Gordon Boys’ Orphanage, formerly in St James’s Street, which was another victim of wartime shelling. After the Gas Company acquired this site they made excavations, 20ft. deep, to build a large gasometer, and in the course of the operations, at the Dolphin Lane side of the land, at the corner of St. James's Street and Fector’s Place, in 1855, they uncovered at that depth, a framework of stout oak, skilfully dovetailed together, which seemed to have been constructed as a hardway over boggy ground, from the river in the direction of the Castle. About 100ft. of it was uncovered, and it appeared to continue, sloping towards the river, and, at the other end, rising towards the Castle. This oak framework is supposed to have been buried there many centuries, having been, probably, used as a landing place for materials to build the Norman Keep of the Castle, though some attribute a Roman origin. A model was made of the quay-like structure to a scale of ½ inch to one foot by the contractors for the excavations, Messrs Bushell and Nightingarl, for Mr Edward Knocker, F.S.A. Two years later, in 1857, Mr Knocker suggested, in a lecture to members of Dover Museum and Philosophical Institution, that the structure had been a Roman causeway built over marshy ground to the river. The model eventually found its way into the Museum, in 1934, by way of a gift from Mr Martyn Mowll, who bought it at an auction in 1909. The quay-like structure had a mean width of 12 feet and stood at right angles to the present line of the river 80 yards away. The north side rested on bog earth and the south side on sand. The long beams of wood were of one foot square section. The model of the quay-like structure found off Russell Street in the mid-19th century while excavating a site for a gasometer. It proved to be at least 100ft. long and was about 20ft. below ground. The oak timbers were sound enough to be used to make the model. Another interesting picture of the comer of old St. James’s Street and St. James’s Lane leading into Townwall Street, in 1925. 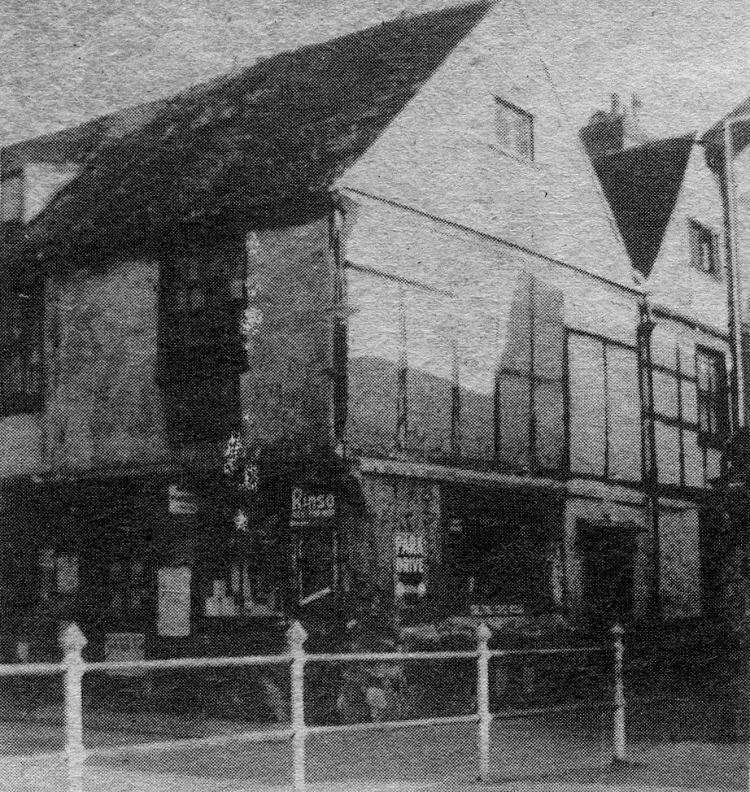 Then the general store of A. Wylde the ancient shop on the corner survived until the outbreak of the last war. The projecting upper storey of the building was a pointer to its great age. It was one of the last such examples of old domestic architecture to survive into the 1940s. The proliferation of advertising signs was typical of the pre-war period. Beyond the hoarding on the right stood the old Town Mill which was demolished about 1956. In the other picture of the same corner, taken in 1939, the shop has even more signs. 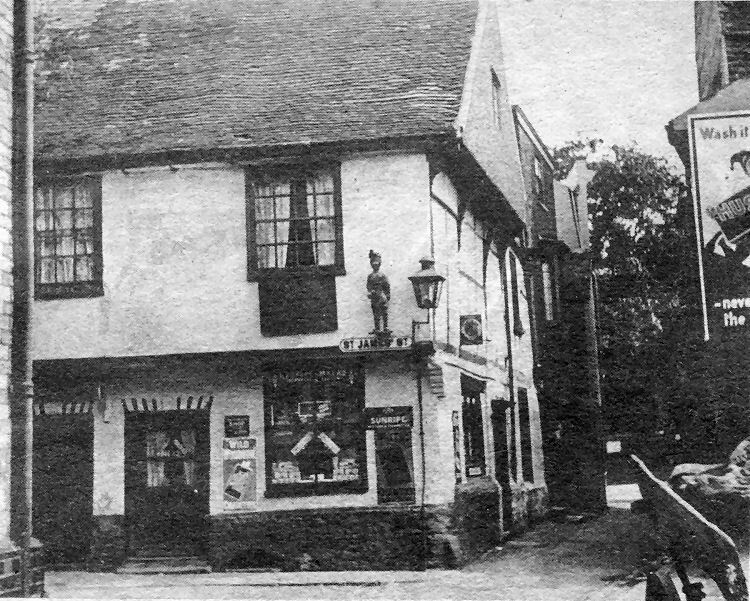 By then it had been taken over, along with the adjoining premises, by Benjamin Bright who continued to run the shop as a general stores, but the A. Wylde sign survived below the first floor window. Gone, however, is the old gas lamp and the interesting figure adjoining it projecting over the pavement in the picture above. A rather rudimentary electric light fitting with a naked bulb replaced the gas lamp.